And that person is KAT-TUN’s Yuichi Nakamaru. He’s someone in Johnny’s that’s on the honor roll and rarely in any scandals. Finally some insight on Nakamaru’s past love life. The girl from his high school seems to be working in a company office, really normal; its more his type. 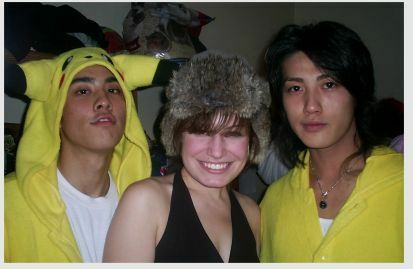 Nakamaru was classmates with this girl. Because of the girl’s parents being really strict, they had a tough time back then. Nakamaru’s dad is a police officer so he had to think things over carefully. Nakamaru is a top idol, so things are different for him, but he was still serious about her and kept in contact, even after all this time. It’s a wonder how he got into the same group as Koki Tanaka and is able treat him like everyone else? Even though it said that the members of KAT-TUN don’t get along, Nakamaru seems to be the only one that can stay out of the media. It was only six days ago that Junnosuke Taguchi of KAT-TUN and actress, Rena Komine, were spotted at Narita Airport for a lovey-dovey get-a-way. After that came the flood of questions, to which, he did not answer. Well I wouldn’t answer either if I came back from Hawai’i in a pink shirt, jeans and sunglasses. I’d want to get home as soon as possible. Oh Junno, what are you sorry for? So what if you like older women? I guess as long as she ain’t ugly your good to go. Besides it’s not like your as wanted as Jin or Kame, because we all know KAT-TUN is really just those two. Koki said, “It’s so croweded in Shibuya, everyone is like a sardine, there’s no room to walk. I just kind of felt like I wanted others to notice me.” But walking around downtown with a disguise isn’t strange, is it? I guess the dilemma is the place in question; where he was at. It’s where his ex-girlfriend, Yuu Kinoshita lives. It has been a couple of years since then, especially since she confessed to someone else there (Toshiji Fujiwara)…. but why would you go to a place like that alone? It does look like that the girl is his ex-gf’s little sister. Her and her friend went to meet him in front of the station. This certainly sounds like a scandal, especially since he’s an idol and part of Johnny’s Entertainment. 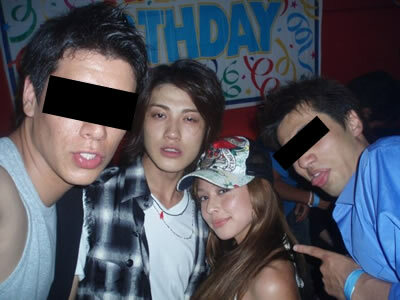 There are many celebrities like Koki that have a lot of girlfriends. “The ones that look like they are mad, are the cool looking ones.” That was part of our conversation, its just one scandal after another, one girl after another, like a play. Oh why would anyone give this boy a second look? Even a first one? I’ve heard things about him and it just makes me wonder why girls are attracted to him. Maybe because he’s a Johnny’s boy, but still. He tries so hard at trying to be cool, it makes him look un-cool. I remember when I was in Kabukicho last year around Christmas time, I could have sworn I saw him, but I wasn’t sure. It certainly looked like him, but all Japanese boys look identical. It didn’t help he stared at me for a good while, but that was probably because I was staring back at him because he looked familiar.